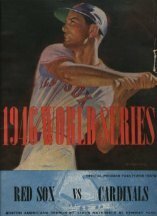 The 1946 World Series was played in October 1946 between the St. Louis Cardinals (representing the National League) and the Boston Red Sox (representing the American League). In the eighth inning of Game 7, with the score 3–3, the Cardinals' Enos Slaughter opened the inning with a single but two batters failed to advance him. With two outs, Harry Walker walloped a hit over Johnny Pesky's head into left-center field. As Leon Culberson chased it down, Slaughter started his dash. Pesky caught Culberson's throw, turned and—perhaps surprised to see Slaughter headed for the plate—hesitated just a split second before throwing home. Roy Partee had to take a few steps up the third base line to catch Pesky's toss, but Slaughter was safe without a play at the plate and Walker was credited with an RBI double. The Cardinals won the game and the Series in seven games, giving them their sixth championship. Boston superstar Ted Williams played the Series injured and was largely ineffective but refused to use his injury as an excuse. The World Series was back to the 2–3–2 format for home teams, and has been used ever since. The year 1946 represented one of the most exciting and prosperous years in American (and baseball) history. The war against the Axis powers had finally ended in August of '45 and most of the Allied troops were returning home after serving overseas. Major-League Baseball had played a major part in supporting the war effort and provided a much-needed escape from the daily emotional and financial stress felt by most on the homefront. Many players had been called to action and their absence was felt in both the clubhouses and stands of every major ballpark. As both players and fans returned from their tours of duty, baseball was once again reborn as America's National Pastime. Despite losing several key players of their own, the St. Louis Cardinals had repeatedly topped the National League in '42, '43 and '44. Nothing changed for the '46 season, however, when the Cards and Brooklyn Dodgers tied for the top spot in the National League, both met in the Major-Leagues' first-ever pennant playoff. The Redbirds managed to beat the Dodgers for two-straight (in a best-of-three match) capturing their fourth National League flag in five seasons and another ticket to the Fall Classic. After the Red Sox opened the Series with a 3-2, ten-inning victory that was decided on a Rudy York homer, Harry Brecheen came back the next day and evened the score with a 3-0, Cardinal triumph. Game 3 showcased the pitching talents of Boston ace Dave Ferriss, who threw shutout ball in a 4-0 winner that appeared to put the Red Sox ahead of the pace. Unfortunately for Fenway fans, the "Curse of the Bambino", was in effect as Enos Slaughter lived up to his surname with a 12-3, twenty-hit "slaughter" of his own. Whitey Kurowski and rookie catcher Joe Garagiola both matched the outfielder's efforts with four-hits each. Following Joe Dobson's four-hit, 6-3 decision in Game 5 that sent Boston ahead three games to two, Brecheen squared the Series by stopping the Red Sox, 4-1. An unlikely hero, the Cardinal pitcher had compiled a 30-9 record in 1944 and 1945, but had fallen to 15-15 in 1946. Still, his 2.49 ERA and five-shutout performances had dulled some of the doubts from his .500 season. Now he stood as a two-game winner with a crucial victory that forced one of the most exciting Game 7's in World Series history. After seven innings at Sportsman's Park, St. Louis held a 3-1 lead over Boston. Murry Dickson had allowed only one hit since the first inning and the Cardinals' right-hander added a tie-breaking double in the fifth that scored Harry Walker. The pitcher crossed home himself when Red Schoendienst singled, but unfortunately, his work was only getting started. Now, in the top of the eighth, Dickson would face Boston's eighth, ninth and first-place hitters. The first batter was to be Hal Wagner, but Manager Joe Cronin made a quick change and sent in Glen Russell who singled to center. Joe Dobson (who had relieved Ferriss in the fifth) was due up next, and this time Cronin sent in George Metkovich. The result was a double to left, and Boston had the potential tying runs in scoring position with no one out. St. Louis' rookie manager, Eddie Dyer saw trouble on the horizon for Dickson and responded with a call to the bullpen. Lefthander Harry Brecheen, who was already a two-game winner in the Series, reported to face two of Boston's best left-handed hitters; Wally Moses (who had collected over five hits in eleven at bats so far) and Johnny Pesky. Brecheen started off strong and promptly struck out Moses. Then he got Pesky to line out to Slaughter, whose textbook throw to the infield kept the runners on their bases. Next up was the right-handed-hitting Dom DiMaggio. "Joe D's" little brother, came through by ripping one off the wall in right-center field. The blast scored Rip Russell and Catfish Metkovich, tying the game at 3-3. Despite the sudden rally, the Cardinals' pitcher managed to get out of the inning by retiring Ted Williams on a popup. As the Red Sox took the field in the bottom of the eighth, Bob Klinger was sent out to the mound, Roy Partee had replaced Wagner behind the plate and Leon Culberson was now stationed in centerfield. Enos Slaughter led off with a single and raced home after Harry Walker hit a shot over Pesky's head into left-center. 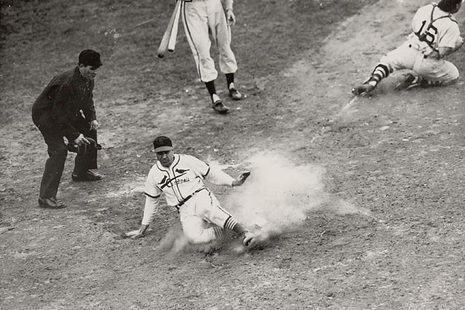 Slaughter had managed to stretch a safe trip to third and his daring baserunning had thrust St. Louis into a 4-3 lead. Brecheen continued the suspense in the ninth after allowing singles to Rudy York and Bobby Doerr to open the inning. As the Sportsman's Park fans winced in anticipation, Pinky Higgins hit into a forceout that moved pinchrunner Paul Campbell to third. With one out, Boston's tying run was now only ninety feet away. Partee came up next and fouled out to first baseman Stan Musial, leaving it up to pinch-hitter Tom McBride. In a final stand, the Cardinal's MVP ace induced the outfielder with a grounder to Red Schoendienst at second base, who tossed the ball to shortstop Marty Marion for a game-ending forceout and the Cardinals' 6th World Series title.